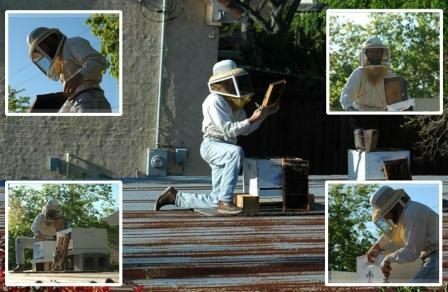 Our urban bee keepers are Brandon & Susan Pollard. Pictured is Brandon working on our hives. Those in the Dallas Fort/Worth area who need to move bee hives can contact Brandon & Susan Pollard at the Texas Honeybee Guild 214-826-8696 or Janet Rowe, the Bee Charmer at 214-695-3425. In other areas of the country, contact your Local Bee Keeping Organizations. Learn more about bees! 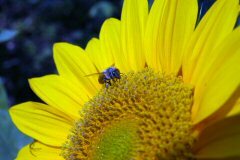 Read these arrticles from the Dirt Doctor library: Bees; Bee Colony Colapse NOT Affecting Organic Hives; Bee Keeping; Bee Charmer - Janet Rowe. If you have any questions regarding this newsletter or any other topic, join me and my guests for my radio show heard in Dallas/Fort Worth across the country on Sunday from 8 - 11am (CT). Radio.